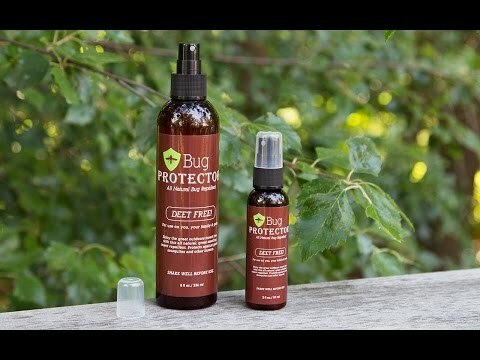 This all-natural bug spray has a scent that’s refreshing to us, but repellant to bugs. It combines lemongrass, geranium, peppermint, and cinnamon oil to keep bugs alive but at bay. You won’t be releasing toxic chemicals into the environment, or spraying them on your skin. 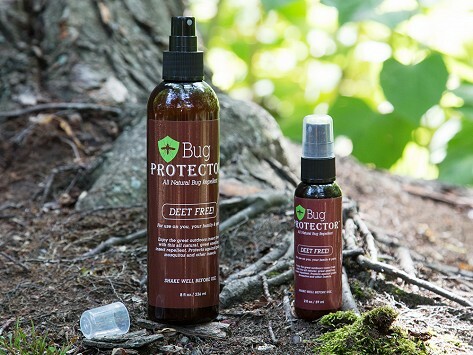 As a certified B-Corp, Bug Protector is DEET-free and safe for the whole family to use. Dimensions: 8 oz: 8" x 1.625"; 2 oz: 5.25" x 1.25"
Weight: 8 oz: 0.5 lb. ; 2 oz: 0.125 lb. Spray in when going on a hike where I know there are bugs! Keeps them away! No itchy bites for us! This all-natural bug spray is made from ingredients you might find in your pantry. The combined scent of lemongrass, geranium, peppermint, and cinnamon oil is pleasant for you, but not for insects.